Fluoride toothpaste. A fresh start for your smile. Whiter teeth in five days. With professionally designed ingredients. Enamel friendly for daily use. 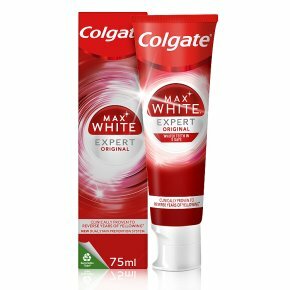 Colgate Max White Expert Pearl Mint Toothpaste is professionally designed to reverse years of yellow stains caused by food and drink. Featuring professionally designed ingredients to give you whiter teeth in just 5 days... it's a fresh start for your smile! Suitable for daily use. Not for the use of children under 7 years old. Always read the label. Directions for use: Brush for 2 minutes, twice daily. Not for the use of children under 7 years old. Not for the use of children under 7 years old.